Happy Birthday, Shakespeare! You may be turning 450, but to us, you don’t look a day over 300. Your impact on today’s society keeps you young — your plays are reenacted by kids and adults across the globe, your invented words are used in the English language on the daily, and your style is as fresh as ever. If your school taught English literature, odds are you studied a Shakespearean play. You might’ve walked into the first day of class rolling your eyes, but you quickly found yourself hooked. In no time, you were vehemently vouching for Beatrice’s importance in Much Ado About Nothing, or unintentionally identifying with Iago from Othello (yikes…) in front of all your classmates. Whether you ran to drama club auditions, read plays under the covers with a flashlight, or simply kept the works and lessons close to your heart, Shakespeare tends to make a lasting impact. The guy’s plays started hitting theaters in 1592, and we’re still talking about him. A Mango can only dream of that kind of longevity. When you’re writing plays about love, jealousy, and betrayal, you’re bound to dish out some pretty epic insults – especially if you happen to possess the dramatic chops of Shakespeare. For all the speeches contemplating love and the meaning of life, there’s also some pretty straight forward, old-school burns. Want to throw down Shakespearean style? This handy site brings together some of Shakespeare’s most memorable insults. Use them wisely – they’re known to prompt some pretty serious consequences. This requires no explanation, only photographic evidence. The man had style, and on his birthday, we raise a glass to his Renaissance ruff collar and the legacy it left behind. For future actors, playwrights, and poets, you've set the fashion bar very high. If we hear one more person ask if it hurt when she fell from heaven, we’ll go all Macbeth on you – you can do so much better. Shakespeare knew true romance, and he composed stacks on stacks of blush-worthy pick-up lines that would send your lover, best friend, and current partner into a frenzy. Shakespeare's characters were the original Romeos (truly! ), and they wooed, courted, and sweet-talked with the best of them. We can nearly hear Romeo now, dazzling Juliet: “Sin from thy lips? O trespass sweetly urged! Give me my sin again.” Romeo, Romeo, wherefore art thou Romeo? Just a head’s up, we’re here at Mango Headquarters, waiting for you. Shakespeare is responsible for over 1700 common words in the English language. We've managed to turn “mango” into a noun, adjective, and occasional verb, which means we've only got 1,699 to go before we're on Shakespeare's level. Just to name a few, we were shocked that these words have Shakespearean origins: elbow, champion, blanket, fashionable, gloomy, puking, swagger, and amazement. Next time you use a Shakespeare-invented word, pay homage to William S. He’s the reason people are able to be in amazement of your fashionable elbow swagger, you champion. We've all got a little bit, or a lot, of Shakespeare in us – and today’s the day to drop some quotes, propose a toast, and spend some time with the man, the mystery, the legend: William Shakespeare. Happy 4-5-0, Shakespeare! Take Romeo and Juliet to the next level by quoting lines in one of the Romance languages. 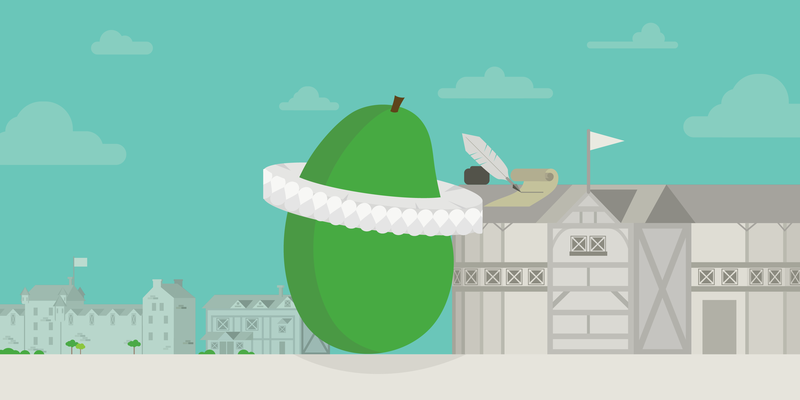 Make Shakespeare proud, and explore a new language and culture with Mango today!